At the height of America's post–Civil War expansion, Colorado Territory was a land of great hope and opportunity. Forged at the confluence of commerce and geography, Colorado became a state in 1876, and Denver, the Queen City of the Plains. To address the growing need for efficient transportation throughout the state, early railroads such as the Kansas Pacific and the Denver and Rio Grande were built in the 1870s. Serving all of these routes was the Denver Union Depot with its commodious dual-gauged tracks. These "steel roads" would become the region's economic lifeblood, hauling freight and passengers to the booming mountain mining towns, returning with ores for processing, and serving as the direct link for passengers and freight between the Rocky Mountains and the industrialized East. 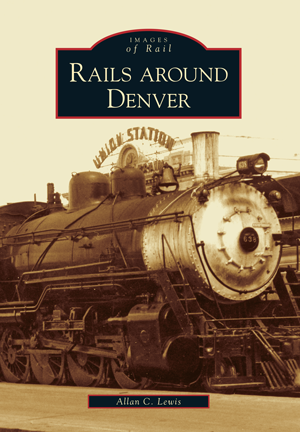 Featuring many previously unpublished images, Rails around Denver examines the contributions of individual railroads and captures the thrill and nostalgia of a bygone era. Author Allan C. Lewis maintains a strong interest in the transportation history of the American West and has spent the last 30 years assembling an impressive library of images. He is also the author of Forty Miles to Fortune—the Florence and Cripple Creek Railroad and four previous Arcadia publications.